Everybody knows us bingo players are a bit ker-ay-zeeeee, right? Well, if you're one of the giddy gang, you're in good company and you'll be right at home at Dotty Bingo. Dotty is your larger-than-life hostess who greets you when you register, and she will guide you through her party palace of 75 ball, 90 ball, speed, and free games. Dotty may look a tad scatterbrained, but she is truly switched on – she dishes out regular cashback bonuses, chat game prizes, and free slot spins. Combine that with advanced security, 24-hour customer support, and world-class Microgaming software, and you'll soon see that Dotty is no daydreamer whatsoever. Dotty is also the star of a rather saucy TV commercial featuring a man dressed as a rabbit. I'll leave the rest to your imagination. 75 ball, 90 ball, free games, speed, slots, casino, roulette, scratchcards, keno, blackjack, video poker. Microgaming. The site is instant play, no download necessary. Customise your experience precisely how you desire and enjoy those advanced graphics, animations, sound effects plus other whistles and bells. Actually, considering the theme is supposed to be 'Dotty', it's a fairly sedate site. Nothing too flashy, and the red and white spotty background isn't at all overwhelming on the eye. Dotty loves those loyal players, and she lets you earn points every time you play. The currency is Dotty Points, and you earn them in 500 point increments. 500 points equal a £5 casino bonus. Points expire after 90 days if they're not redeemed. Visa, Visa Debit, Maestro, Ukash, Moneybookers, Neteller, Entropay, Citadel, Eco. Dotty flies the prestigious eCOGRA certificate of approval, meaning the highest levels of safety and security. 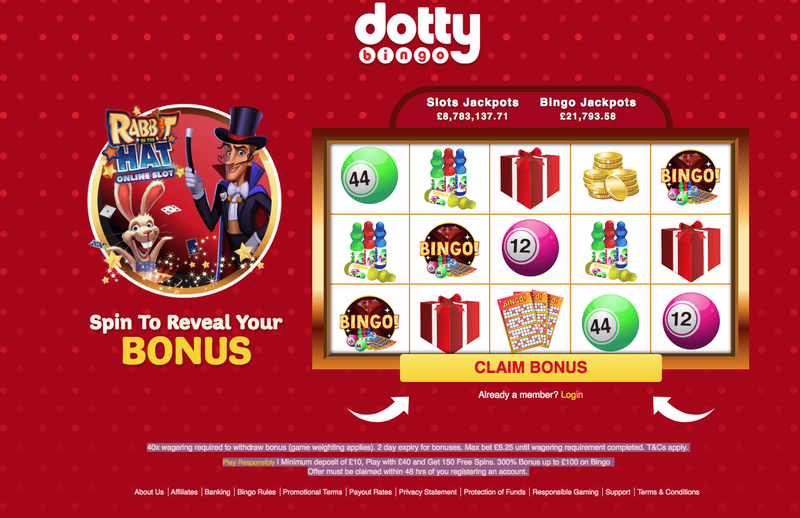 Dotty is authorised by the Lotteries and Gaming Authority of Malta, and is owned by Megapixel Entertainment. Dotty Bingo is not part of a network. No, you are not required to download this bingo game, there is an instant play version at Dotty Bingo. No, Dotty Bingo does not offer a downloadable version but you can play instantly on the site. No free bingo rooms currently available.